This of course led me to ask — where they wrong indeed? Or did Deibold/etc. strike? That promise was well documented for the last year or so. He literally said that he is "committed to helping Ohio deliver its electoral votes to the president next year." Blackboxvoting.org also wonders, "Did the voting machines trump exit polls?" The same site was kind enough to provide me with the raw state-by-state data showing final polling and real results (as far as we know them at this time). A blog called The Industry Standard was kind enough to collect the data on the number of counties using electronic voting in each state. 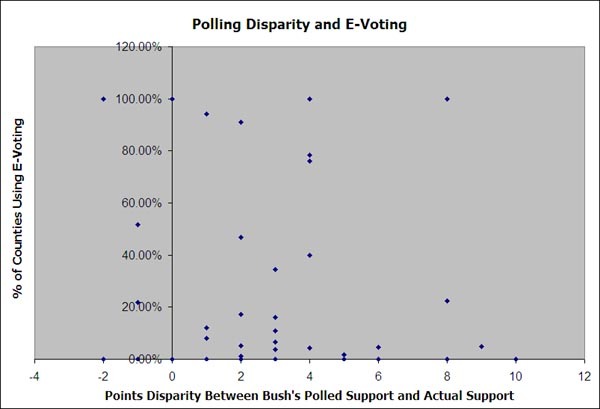 The following chart compares the difference in Bush's polled and real numbers with the number of counties with e-voting (of any type, not just Diebold's machines). The results are all over the place, with no trends in sight. Some states with no e-voting had large disparities, while some with lots of e-voting had none. This analysis shows no evidence of malfeasance. Of course, there is no reason to think that this would be the most helpful analysis anyway. If some e-voting companies wanted to rig the vote, they would be much more likely to single out precints and/or counties and thus would not affect the entire state. So a look precint-by-precint at the disparities compared to e-voting status woudld be far more helpful, although again a lack of an obvious trend would not exonerate those companies. In the end, I remain suspicious of Diebold and other companies, for well documented reasons. Nevertheless, unless some breaking news hits, I doubt that any pattern of misconduct will show in further analysis. It seems the people have simply chosen to re-elect George W. Bush. 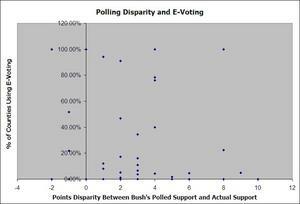 In Full of Holes (Newsweek), Brad Stone reports on how the polling groups got it wrong. Helpful read.